Power Strength Training Systems has been a powerful addition to Spencer’s weekly workout routine since he joined PSTS in December of 2017. Spencer entered his Junior year of Football, at South Christian, as a TE turned left OT. Even though he was a hard worker three days a week in the school the weight room, he entered the football season at 245 pounds. 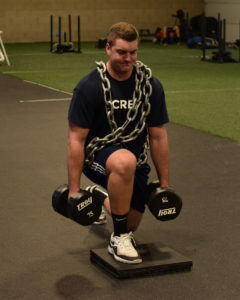 Spencer, at 6’5″ and 245 pounds needed to find a way to add strength, muscle, flexibility and leadership skills if he wanted to play football at the next level. I knew Spencer needed more to help him make it to the highest level of college football. Spencer heard about PSTS from a few players on his team. I looked into PSTS by talking to the player’s parents and finding other players and parents who were involved at PSTS. Digging deeper, on the internet, I found that PSTS was a perfect fit for Spencer to take a leap forward in his training. Spencer and I met with Mark Ehnis, owner of PSTS, and had the opportunity to sit and talk about what it was that Spencer and I were hoping to get out of PSTS. Mark wanted to know what his goals for football were and how could PSTS help him achieve them. They took Spencer, as an individual, and put together an outstanding individualized program that complemented his High School weight program. Spencer began working out at school three days a week and at PSTS three days a week. You may say, six days a week? But, PSTS does so much more than strength training. They work on the athlete’s full body flexibility. The PSTS staff work on proper technique in ALL aspects of the things they do. They demand your best in all things. They push you to be the best you can be. They want you to reach your goals. Spencer joined the Monday night Premier Group, all High School football players who desire to play at the college level. These young men pushed each other to the limit each week. They spent time, at the end of each Monday workout, to talk about leadership and how they can be leaders on the field and in school. Wow, what great stuff. I wish they had this when I played football. It’s truly outstanding. Spencer loves going to PSTS. He loves the staff and the athletes he works out with. He has become friends with players from all over Western Michigan. They all chat, motivate and encourage each other. It has been a great experience for Spencer. Since December and with the help, encouragement and direction that PSTS has given Spencer he has turned his 6’5″ frame into a steely 280 pounds of muscle. PSTS staff members prepared him for college football testing; 40 dash, vertical jump, shuttle run and broad jump for college football combines and showcases. Spencer put in the time and worked hard to achieve his goal of landing a Division One Power Five full scholarship. There is no doubt that this would not have happened without the PSTS staff and their commitment to help Spencer reach his goal. Spencer will be signing, during the early Division one signing period in December and will be an early enrollee. He is very excited. He will always be a Power Strength man, and thanks the staff for all they have done for him to achieve his goals. PSTS will always be there to encourage and support Spencer and all the athletes at PSTS.